Oil painting by P. F. Flickel in the castle garden Oil on canvas painted painting. Representation of an opposing, gallant Rococo pair in front of the stairs of the castle garden. Two well-heeled gentlemen are also watching in the background. 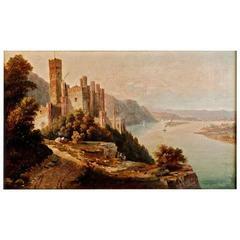 Signed by Paul Franz FLICKEL (1852-1903) Probably Sansoucci Castle in Potsdam? (S-191). - Oil on canvas - Illustration of cows in stall - Registered artist - Sign Felix Eisengräber (S - 198) Oil. Old oil painting 18th century Illustration of waterfall in roman mountains 18th century painting in a gilded frame Very fine painting. Large-scale acrylic on canvas painting of an Asian style teapot. Signed lower right "Dan Poole" Dated 1977. Original wood frame.